A lighter, fluffier pumpkin filling with an unapologetic cloud of whipped cream go into this Easy Pumpkin Chiffon Pie recipe! This no-bake (flakey crust optional) dessert will clear up tons of room in oven for turkey at Thanksgiving. Between my jumbo bag of Boom Chicka Pop Kettle Corn (my monthly treat to myself for making in out of Costco alive with an active 10-month old) and salted-caramel EVERYTHING, my love for sweet and salty treats has hit an ultimate high. Not only must I end a meal with some-sort of dessert at least about 85% of the time (who's with me? ), but I usually follow that up with something that has a bit of salt and crunch. 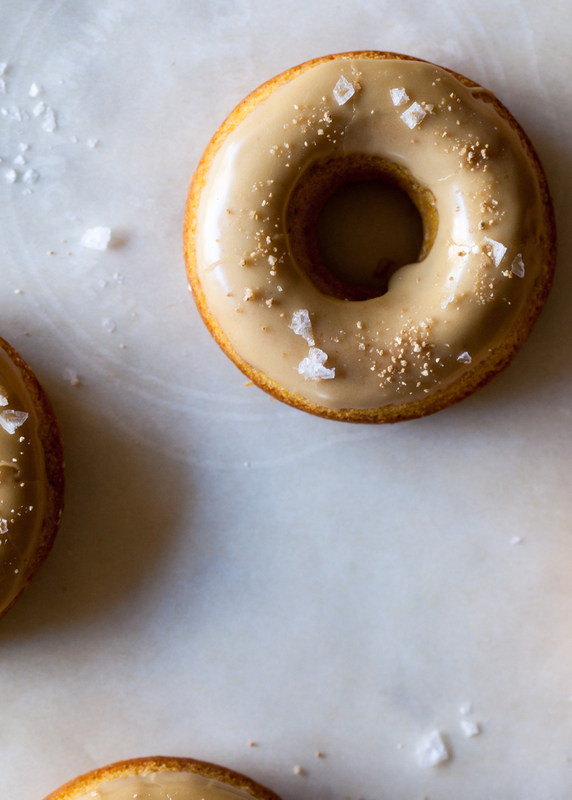 While this might seem a bit much (also probably not very healthy), who is to complain when my cravings result in something as amazing as these Salted Maple Pumpkin Donuts?!?! I was ultimately inspired by this spice blend from Sweet Is the Spice (thanks to my monthly Hatchery.co box), my husband's love for donuts of all kind, and maple - because we are in Canada after all. Oh, and pumpkin - 'Tis the season! I can't even imagine a time before sea salt and caramel went together. So sweet, so salty - so delicious! When I made a cinnamon caramel sauce earlier this season, I thought I would try it without the salt. Even though it was packed full of other yummy flavours, it was just not complete with a pinch (or a few) of salt. Equally sweet but much more Canadian and donut-approved, I figured maple glaze would be perfect for my pumpkin donuts but could also stand to be kicked up a notch with a bit of sea salt. After baking off the donuts, I dunked them in a bath of classic maple glaze then gave them a sprinkling of both Maldon Sea Salt and the Sweet & Salty Surrender blend. Preheat oven to 350 degrees. Prepare a donut pan and set aside. In a large mixing bowl, whisk together the oil, egg, and egg yolk. Add in the sugars, maple, and pumpkin. Whisk to combine. Sift in the dry ingredients and stir until combined. Fill the wells of the donut pan about 2/3 to 3/4 of the way full. Bake for about 12 to 15 minutes, or until a toothpick inserted in the donuts comes out clean. Cool on a wire rack before dipping in the glaze. Combine all of the ingredients until together until they form a thick, but smooth paste. Add only enough milk so that it is slightly fluid. Use immediately. Place the maple glaze in a shallow dish just big enough to hold the donuts. Dunk the top surface of each donut into the glaze and let dry slightly on a wire rack. To prevent from making a huge mess, I like the fill the donut pan with a piping bag. The batter can be rather fluid. I find it best to fill a disposable piping bag, then snip off the tip once the batter is already inside so that it does not spill everywhere as I fill it up. If the donuts are stored overnight, the salt will begin to dissolve. They might look funny, but will still taste equally delicious the following day. Side note: You guys! Boom Chicka Pop has a Dark Chocolate Sea Salt Kettle Corn for the holidays! If you are looking for a Christmas gift for me, just send me BIG bags of this!! Lately, I've see the most lavish cake recipes with a hundred different ingredients and outlandish flavour combinations and I think "What happened to a good 'ol buttermilk cake and fudge frosting? Or a classic carrot with not-too-sweet cream cheese icing?" I know, I know - I can totally be guilty of trying to reinvent the wheel, er cake, too. And while sometimes we are better off not throwing all of the trendiest ingredients into one cake (I bet there is a miso-matcha-cardamom-tahini cake recipe with brown butter & salted caramel frosting out there somewhere, hehe), other times we should in fact jazz up a classic. With the holidays just around the corner (no really - Thanksgiving is next week), NOW is the time to go ahead and add that extra drizzle of caramel, throw on those unnecessary sprinkles, stick on some gold leaf, and light a few sparklers on top while you are at!! Well, I have done just this! And yes, I just justified (or at least tried to) why its okay to go all-out and switch up a perfectly good recipe. 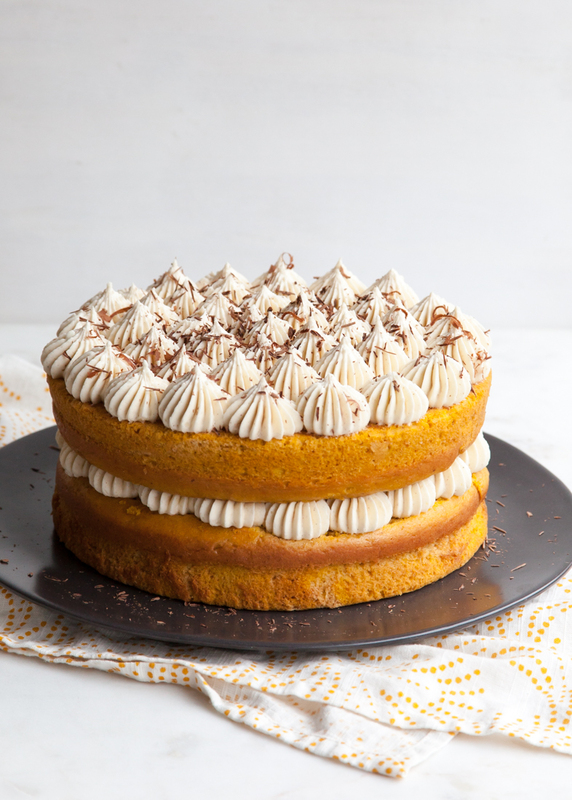 Once you try this Pumpkin Tiramisu, you will understand. I hope. Truth be told, I actually don't care for traditional tiramisu. They are usually a bit too booze-foward for me and I hardly understand why anyone would create a recipe that revolves around lady fingers. However, this is not why I felt the need to change it. I get that a lot of people love them some tiramisu (it is a classic, after all), so I wanted to make a seasonal dessert that everyone could get behind, tiramisu lovers and tolerates alike! 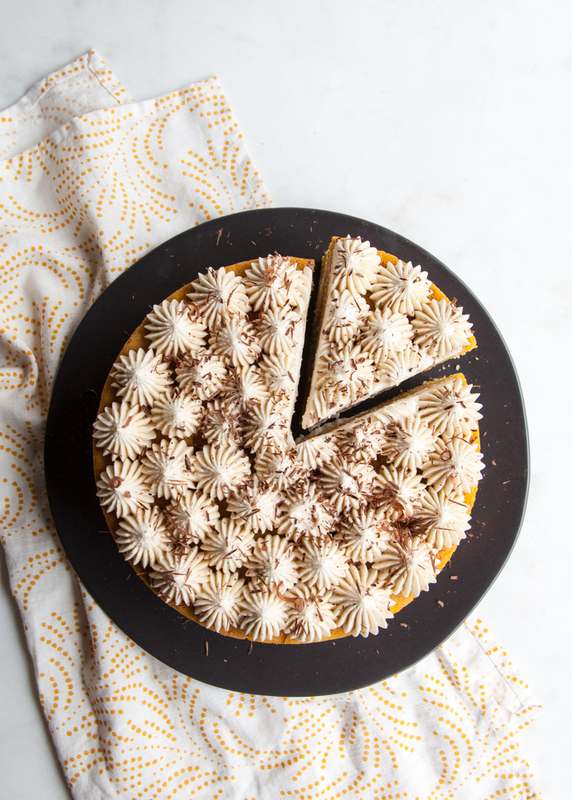 "Traditional tiramisu or “pick me-up” is all about the booze, coffee, and creamy filling. Sticking with the classic dessert-theme, I created an old fashion Heritage frosting (aka Ermine or Cooked-Flour) that still utilized tiramisu’s familiar mascarpone filling. This type of frosting is creamy and fluffy – it still reminds me of the filling used in a regular tiramisu, yet not nearly as rich and without the eggs. 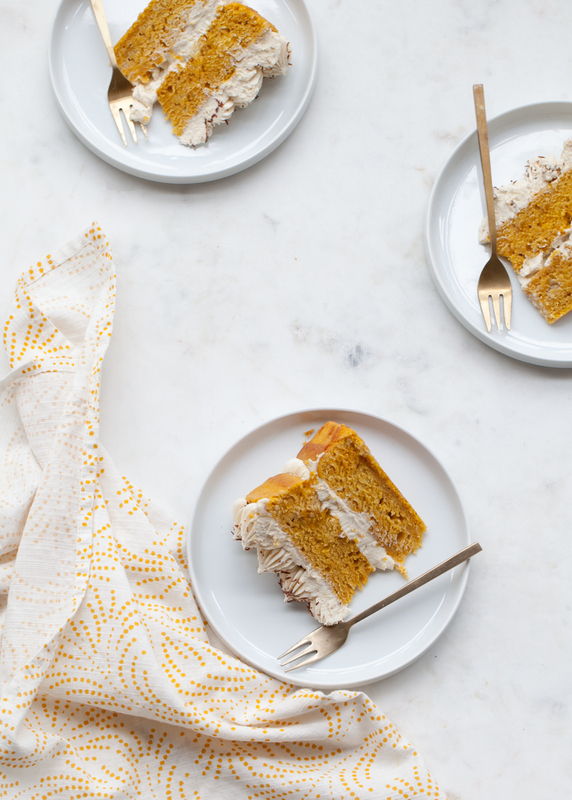 Instead of rum or marsala wine, the cake layers were brushed with a soak made from coffee liqueur to better compliment the pumpkin flavor. A shower of chocolate shavings or cocoa powder over the top makes this cake even more stunning and awe-worthy for the holidays."